Portrait of pain: Deborah Eubanks helped her daughter fight meth addiction and turned it into art. She glitters as she moves across the stage, strutting audaciously. With a sweep of her hand or the breeze of her musical breath, she influences the actions of others. Blending the personas of Shakespeare's mischievous Puck with the ominous emcee in Cabaret, her name is Crystal Meth. From the darkened front row, Petaluma playwright Deborah Eubanks watches Crystal avidly. 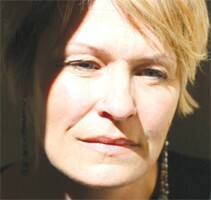 Eubanks' short blond hair is barely visible as she leans forward to focus intently on the actors and then leans back to immerse herself in the reactions of the opening-night crowd in downtown San Francisco. She explains afterward that she felt both excited and extremely vulnerable. "I felt like a bug coming out from under a stone, and everybody going, 'Look, that's her life.' I kept girding my loins and saying this is for the greatest good. People need to know this. You can't fight the enemy unless you know it, unless you know its power and its force." The enemy is methamphetamine, and Eubanks is intimately familiar with its dominating presence. Her oldest daughter went through a heartbreaking but ultimately successful effort to extract herself from meth addiction. Eubanks has transformed the family's roller-coaster journey with the drug into the performance play Crystal Daze, the centerpiece production of this year's DIVAfest at San Francisco's Exit Theater. "It transcended my expectations," Eubanks says of watching Crystal Daze on opening night. "It was much, much more of a pure art form than when I saw it in my mind's eye, because it's so close to home. It's so close to who I am." Born and raised in England, Eubanks trained at the Harold Pinter Studios, designed and ran theater workshops and taught at Covent Garden Art Center before moving to the United States when she was in her early 30s. She's been a director and artist in residence at Petaluma's Cinnabar Theater, has taught voice and Shakespeare at ACT and drama at a private high school in the North Bay, and spent the last four years teaching at the Berkeley Repertory Theater. Eubanks' journey toward the creation of Crystal Daze began several years ago with the difficult realization that the eldest of her two daughters was hooked on meth. Emotionally exhausted by watching her daughter's descent into a drug-induced hell and by her own increasingly desperate search for solutions that ultimately led nowhere, Eubanks began journaling to express her innermost thoughts and feelings. She recorded her joys, when her daughter seemed to be making progress, followed by her deep despair when the drug once again took over their lives. Eubanks used her writing to rage against the harshness of proffered advice--throw her daughter out of the family home and let her sink or swim on her own--and her agony when she eventually made that difficult decision. "When you can look into the face of someone you love so much and you see only the drug, you look and you see only that chemical dancing its wild fire against every muscle, every bone, when you look and see only that, then is the moment when you can't do it anymore," she says. "Then is the point when you say, 'I'm done.' It's the hardest thing in the world to turn your back on the embodiment of that person." Slowly, her writing evolved, becoming less personal, gaining more of a voice and almost a three-dimensional shape. Deeply immersed in theater all her life, Eubanks naturally began to see theatrical possibilities, a way to share her story and her perspective in a familiar form. Eagerly throwing herself into research, Eubanks spoke with DEA officials, meth-addicted inmates and her own young students. She chatted endlessly online with others who had family members hooked on the drug and read everything she could find about it. Eubanks immersed herself in the drug's subculture, learning its language and its black humor. And as her daughter finally began to turn her life around, Eubanks more and more saw her journal writing as the prelude to a play, a highly stylized performance piece exploring meth's deep roots in our society and how the drug tears mother-daughter relationships apart. Applying to Exit Theater's DIVAfest, Eubanks was selected to write Crystal Daze, which is the only fully staged production in this year's schedule. "Out of over a hundred submissions, her play kind of jumped out at me because of the subject matter," says Exit artistic director Christina Augello, who portrays one of the mothers in the current production. "It's a very timely subject matter, and it's also a true story, which makes it very compelling." Written from the heart-rending perspective of two mothers whose daughters have been seduced by the character of Crystal Meth, the play underscores how addiction affects not just the addicts but all the people around them. "Crystal Meth is a character in the show, and there's a competition for the daughters," Augello explains. "The mothers are fighting to save their daughters, and Crystal Meth is fighting to keep them." The play emphasizes that it's the drug that's the culprit, not the daughter. "It's important to distinguish that. You always have to look at it that way, as a mother. You have to remember and try to get her back to that person she was before she was kidnapped by the drug," Augello adds. "The play is hopeful in the respect that it believes there is a way of reaching into the soul and spirit of people addicted to drugs and somehow to help them return by keeping the distinction between the drug and the person." Jessica Fudim did the choreography, not just the opening dance where Crystal Meth takes two beautiful young woman and toys with them until they're nearly unrecognizable in skin-crawling withdrawal, but all of the physical action throughout the 90-minute play. "Movement is really a major piece of how the story is manifested," Fudim explains. Light and set designer Armanda Ortmayer created an exceptionally visual series of translucent sliding panels that evoke images both of the smoke that mesmerizes meth addicts and the ubiquitous baggies in which the drug is sold. Costume designer Lisa Eldrige creatively clothed Crystal Meth in a series of skimpy but glittering outfits, the mothers in subdued hues that reflect their emotional battering, the daughters in clothes that make them appear alternatively angelic (as in their mothers' memories) or increasingly demented (while in meth's clutches). The play was developed collaboratively with the technical team and cast members Augello, Sadie Lune, Lizzie Sell, Joelle Wagner and Cheryl Smith. When personal reasons forced Eubanks to withdraw as director in March, Michelle Talgarow stepped in as co-director. That turned out to be for the best, Eubanks says, because she was simply too close to the subject matter. "They far, far exceeded what I could have come up with." Meth is the ideal drug in our speeded-up society, Eubanks asserts, and its impacts are more far-reaching than most people realize. In the opening dance of Crystal Daze, the daughters rip open angelic-looking nightgowns to reveal dark, sleeveless T-shirts adorned with images of young girls with huge eyes. The girls are climbing out their bedroom windows next to the words "party all night." Costume designer Eldrige found the shirts in the juniors department of a major chain store. The eyes on those "cute" T-shirts are meth eyes, and images of meth permeate our world, Eubanks charges. "When I tell people this, they look at me like I'm a conspiracy theorist. People don't know what they're selling sometimes. It has infiltrated in ways that I think we can't even bargain for." One of her neighbors teaches kindergarten. The woman recently confided in Eubanks that methamphetamine is a growing problem among the parents of her young students. "That shook me," Eubanks says thoughtfully. It also makes her glad she wrote Crystal Daze. "If this play can shift people's awareness, awaken them with regard to methamphetamine and the growing woes of this terrible drug, that's wonderful." Standing on a stage that is extremely simple and yet still seeped in signs of meth, one of the mothers in Crystal Daze declares, "I'm tired of hearing people refer to my daughter as 'the addict.' My daughter has a name." The play gives a voice to those who love meth addicts, down to the occasional but quickly repressed thought that a daughter's death might be better than her continued agony. Crystal Daze is a cry for help from an often indifferent society, and a call to drop the stereotypes and remember addicts' humanity. "I want other people to understand, empathize and begin to consider new and potentially more successful approaches to addiction and to this drug in particular," Eubanks explains with passion in her voice. She just doesn't know yet what those new methods might be. "We need to shift gears and ask more questions than just offering ready-made answers. I don't think we as a society know what the ramifications of this drug might be. I do know that we can't continue watching the ramifications culminating in human debris on street corners." She's already planning some rewrites, and another theater company is considering including a reading of Crystal Daze in its 2008 schedule. Even after the DIVAfest ends, Crystal Daze will continue to offer its perceptions and insights, and its call for new solutions. The answers, Eubanks says, can't be one-size-fits-all. "Every meth addict has a name and a family who loved them and lost them. Somewhere, there's got to be a mother who birthed that meth addict." Performances run through May 26 at the Exit Theater, 156 Eddy St., San Francisco. $12-$20, 415.673.3847, www.theexit.org. The DIVAfest also includes free staged readings of four new plays by women.